Newest addition to the ARHT simulation equipment! One of my medical education interests is looking at how we train and practice rarely performed procedures. For these situations, simulation offers an excellent method of training. The challenge, however, is recreating the fidelity of such situations since many rarely performed procedures are quite invasive. Often we’ll start the training with a task-trainer like model and then progress to a full size manikin. Task-trainers are simulation models specifically designed for one type of procedure. Posted in Simulation	| Tagged Simulation, toxicology	| Enter your password to view comments. 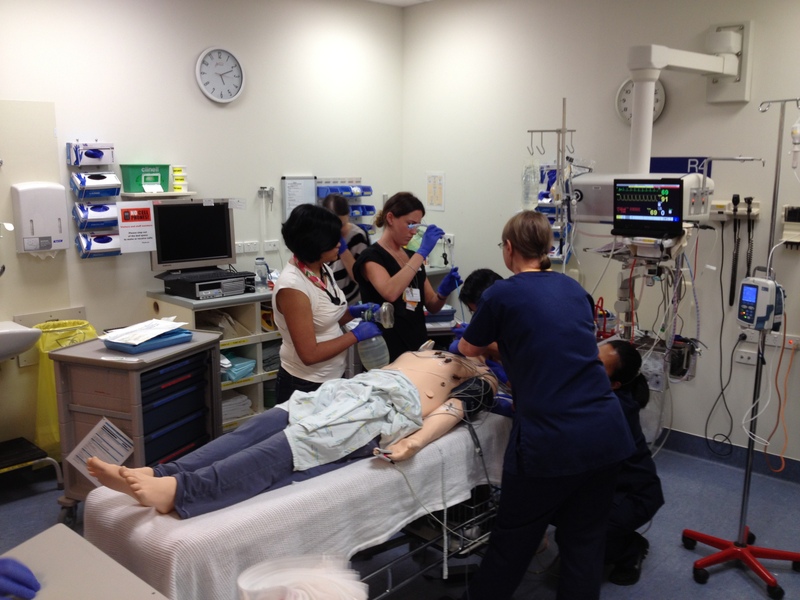 Auckland ED is conducting a lot of simulation training currently, with a recent focus on airway management. Last week a teaching session was delivered by Sam Bendall (an Auckland HEMS doctor) on ‘intubation as a team sport’, which covered human factors in ED airway management and included the use of adjuncts like airway checklists. While Auckland HEMS has an RSI checklist, a similar tool has not been finalized for Auckland ED – this is under consideration currently. Following that teaching session, several airway checklists had nonetheless made their way into our resuscitation areas. High-fidelity simulation training took place this afternoon, led by Sam, Mike Nicholls (another HEMS doctor), and Nancy Mitchell (Nurse Educator). While watching the simulation I spotted a checklist taped to a whiteboard on a side wall. 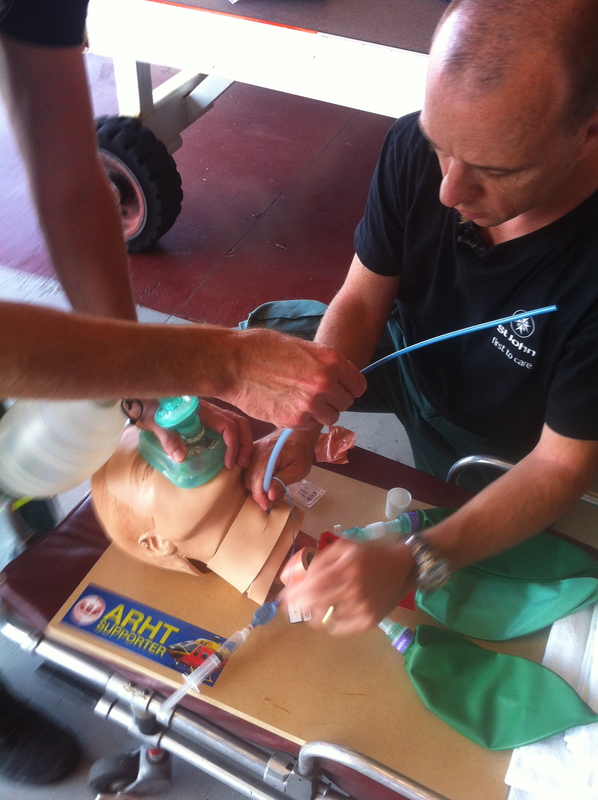 I assumed that was the airway checklist, and thought ‘that’s a clever position – it means the airway assistant can read out the checklist immediately prior to the RSI. They haven’t used it, I must bring this up at the debrief’. 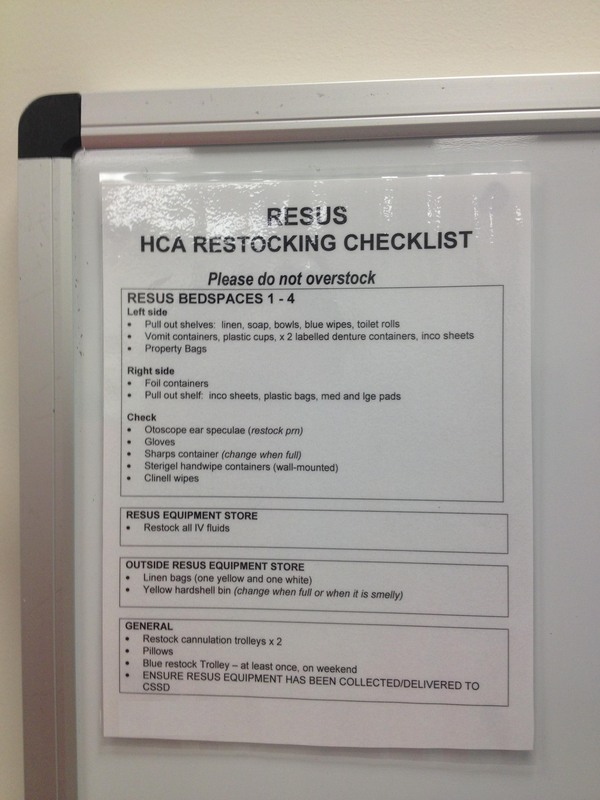 It wasn’t an airway checklist at all, but a restocking checklist! 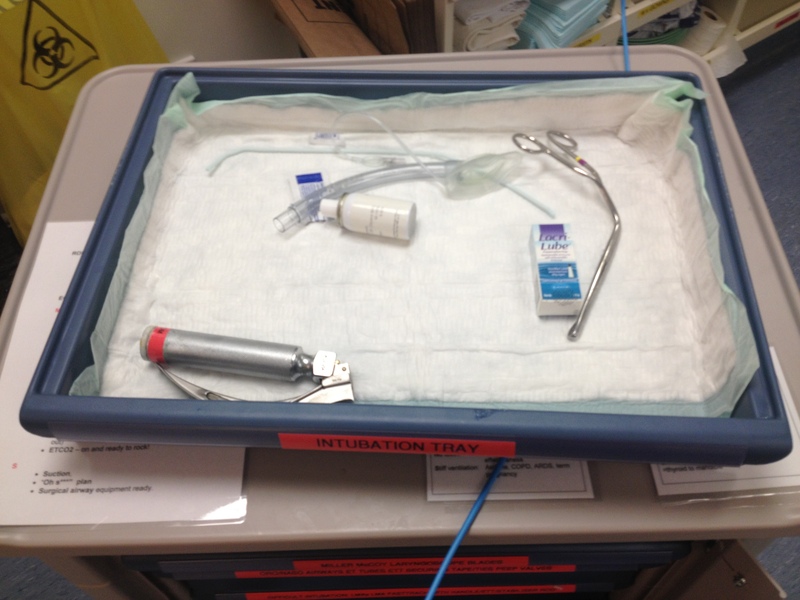 … taped to the top of the airway trolley (logical) but unfortunately covered up by the airway tray, which is removed from the trolley and placed on top when setting up for airway management. This is a good example of a latent hazard. 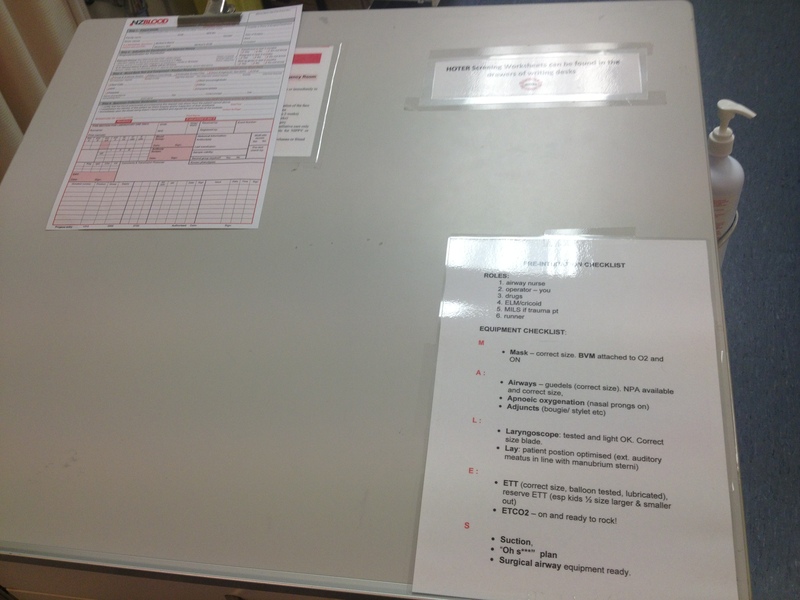 Although this desk is frequently cluttered with paperwork during a resuscitation, accessing the checklist would be a simple matter, and would be done so by a senior person. When confronted with a critically ill patient, it is easy to focus on the scenario in front of us (there is usually quite enough to think about there!) and accept the physical environment as it is. By going a step further and ACTIVELY managing our environment to improve logistics and ergonomics we can increase our chances of a good outcome. This can occur both BEFORE we are confronted with a patient (eliminating the latent hazard above, for example) and DURING a resuscitation. This is particularly important in the pre-hospital setting, where both the relatively unforgiving helicopter and roadside environment provide a range of challenges not encountered in a resuscitation bay. As doctors I believe we have a lot to learn from our paramedic colleages in this area.